Getting to Fulking from Brighton by bus is easy but you will have some walking to do when you alight. The simplest strategy is to catch the No 17 from the Old Steine and get out at the Holmbush Farm stop in Woodmancote. The moment you step into Clappers Lane, you are in Fulking. However, you will need to walk the full length of the lane to reach the centre of the village (allow thirty minutes). An alternative is to take the No 77 from Brighton Station to Devil’s Dyke. This only runs at weekends for most of the year but there is a full daily service in July and August. When you get to the Dyke, follow the South Downs Way west for a mile or so and then walk down one of the bostals into Fulking or Edburton (allow forty minutes). Visiting Fulking by rail only makes sense if you really, really like walking. The closest station is Portslade (3.9 crow miles). Three quarters of the route is across the Downs and you will need an OS map for navigation. Hassocks (4.2 crow miles) will allow you to walk across country virtually the entire way but, again, you will need an OS map. Or you could simply hire a cycle from Hassocks Community Cycle Hire which is right next to the station. An alternative is to take a train to Shoreham. Once there, walk to AOAC (which is not next to the station — allow ten minutes), hire a mountain bike, cycle north on the Downs Link, then turn east on the South Downs Way. Such a route avoids the road system almost entirely. If you prefer to walk along roads, or have a cycle in your baggage, then Preston Park is your best bet (4.3 crow miles): follow Dyke Road Avenue out of Brighton, cross the bypass onto Devil’s Dyke Road, bear right along Saddlescombe Road, and turn left when you see the sign to Poynings. No OS map needed. 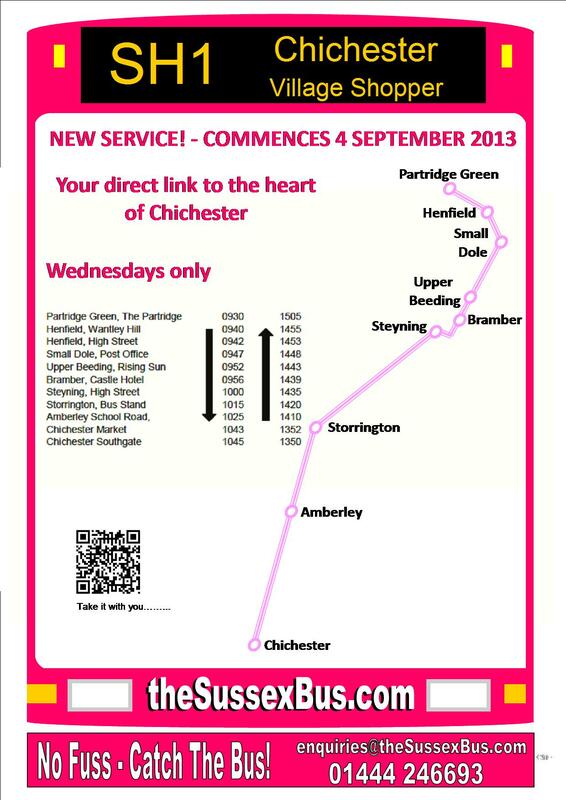 Southern Transit, a company based at the old cement works in Upper Beeding, is introducing a new bus service (No 3) between Shoreham and Horsham that will run every weekend over the period 26th July to 7th September 2014. There’s a stop in Small Dole, buses run every couple of hours, and the usual fare concessions apply. Bus timetables change rather frequently, as do their locations on the web. Thus links are mostly omitted above. But you should be able to find them easily enough by appropriate googling. Try “bus 17 Brighton timetable”, for example. Local residents looking to escape from Fulking without using a car or a cycle should turn immediately to the Community Bus Services page. Updated 16th November 2014 to add link to Community Bus Services page. Updated 16th November 2014 to comment out references to the No 104 and the Poynings community bus. Updated 12th August 2013 to remove references to the Hurst & Hassocks Community Bus [RIP]. Updated 15th August 2013 to revise No 106 sentence and to include SH1 and SH2. Updated 28th August 2013 with SH1 and SH2 timetable links. 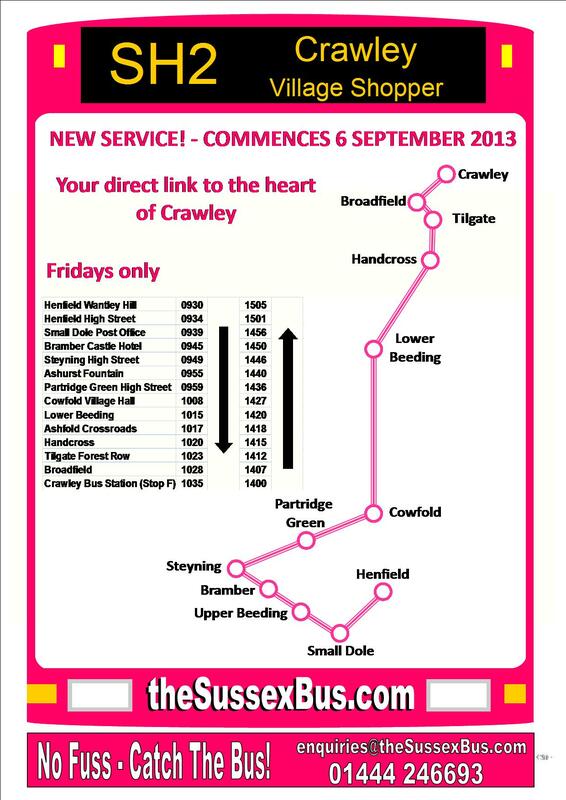 Updated 22nd October 2013 with a link to Hassocks Community Cycle Hire. Updated 7th April 2014 with a link to AOAC in Shoreham. Updated 9th April 2014 with No 104 and the Poynings/Hurstpierpoint community bus. Updated 11th July 2014 to include the new Shoreham–Horsham service.